Over the last 2 years, I’ve personally tried 13 different EMF protection cell phone cases, 16 different anti-radiation cell phone stickers, diodes, etc. and over 100 other EMF protection products. I get asked all the time what I recommend to protect against cell phone radiation, and I think it’s finally time that we took a deep dive into it. I’m going to keep this post fairly focused on the products, and my thoughts about them. That is in part because I don’t want to waste your time with anything off-topic, and in part, because I have tons of other resources I can point you too if you’re skeptical about EMF radiation or just want to learn more (which I’ll do at the end of this article). Let’s start by talking a little bit about what I think you should be looking for in a good EMF protection cell-phone case, and then we’ll get to the reviews. There are a few things that we really want to make sure of when we go to buy a quality EMF protection product. The reality is, as more and more people begin to understand the dangers that EMF radiation poses, the market for protection products grows. As it has begun to grow, more and more companies have entered the market, many with inferior, poorly made, or non-working product. These companies are just trying to make money off a hot new trend, but have not done the work, research, or due diligence to ensure their product will actually improve people’s lives and health. Another disclaimer I want to make real quick is that no EMF protection or anti-radiation cell-phone case is a perfect solution. None of them will, in reality, block all EMF radiation if you are holding the phone up to your head. Our goal with a quality case is simply to reduce EMF radiation exposure. Although many of the ones I recommend here will reduce your exposure, there are some other really important ways to reduce your cell phone radiation exposure that I’ll encourage you to follow later in the post. I also want to mention that the cases I talk about here, are ones intended to allow you to actually use the phone in its full functionality. If you are looking for a way to block 100% of the radiation from your cell-phone when you are not using it, then you can check out my article on the best RF blocking and faraday bags here. It’s also extremely important that you actually use the cases as they are intended to be used. Many of the best EMF blocking cases that I mention down below, can actually increase your exposure to EMF radiation if not used properly. For example, the flip cases, that have a flap of EMF blocking material to block the radiation while you are using the phone, need to be used this way. If the flap is on the back side of the phone while you are on a call, you may actually be increasing the radiation, not reducing it. Take a quick look at this news piece from a year ago, where an EMF expert shows that these cases do in fact work most of the time, if you use them as intended. Don’t worry though, I’ll be sure to talk about the correct way to use each case when I’m reviewing them down below. EMF Protection – Most importantly, we want to make sure that the case we are using actually does reduce our exposure to EMF radiation. Some cases that are poorly made and designed, can actually increase your exposure to EMF radiation, which we’ll talk about more later. Quality Case – Since we use our cell-phones constantly, we want to make sure that the case is actually nice to use. We want it to use good materials, be comfortable, not hideous and have high amounts of functionality. Reputable Company – We want to make sure we’re buying from a company that has been around a while, and not someone that is just private labeling a foreign knock-off product. Research – We want to make sure that the company has research displaying how their product blocks or reduces EMF radiation from your cell-phone. Now, some companies studies focus on the blocking material more than just the full case, which we’ll talk about more later. Customer Service – It’s surprisingly important that we have access to customer service to ask questions, get help, and return the product if it isn’t working for us. Price – Some EMF products on the market today are marked up to extreme prices, making them essentially unaffordable for many people. All of the cases I cover here today are, what I would say, affordable. Alright, now let’s get to those cases. The time has come, let’s talk about the best products available today. I’ll do my best to update this list as I learn more, try new products, and new research comes out. These rankings are based solely on my knowledge, experience, and research. Nearly all of these cases I own and have tried and tested myself on my own cell-phone. Some of the cases were given to me to test by the companies, but I assure you that I never let that impact my rankings or review of these products. If you have any specific questions about my experiences, please feel free to contact me! Alright, let’s start with the case that my wife and I are currently using on our cell-phones, from Defendershield. I absolutely love this case, and have been using it for quite a while now. The quality of the case is outstanding, and it does an extremely good job of blocking the EMF radiation while talking on your cell phone. If you’ve read my article reviewing the best air tube headphones, where I rave about the Defendershield set, then you probably know how passionate I can get about quality EMF protection products. 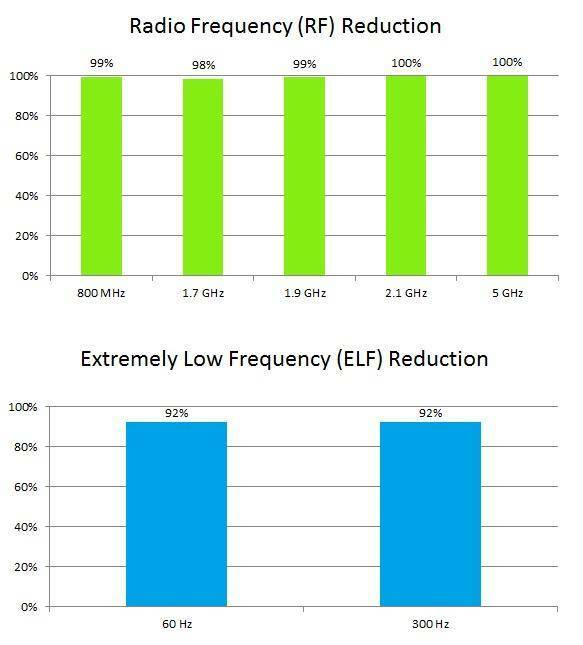 The material that they use in their cases to block RF radiation has been tested to block nearly 100% of EMF radiation in an FCC certified lab, you can see those results here. However, I have personally found that the case does reduce EMF radiation significantly when talking on the phone. Obviously, if you’ve watched the video up above, you probably know that this is impacted by all kinds of things such as the network you’re on, which direction your phone is putting, and most importantly, whether you are using the case correctly. 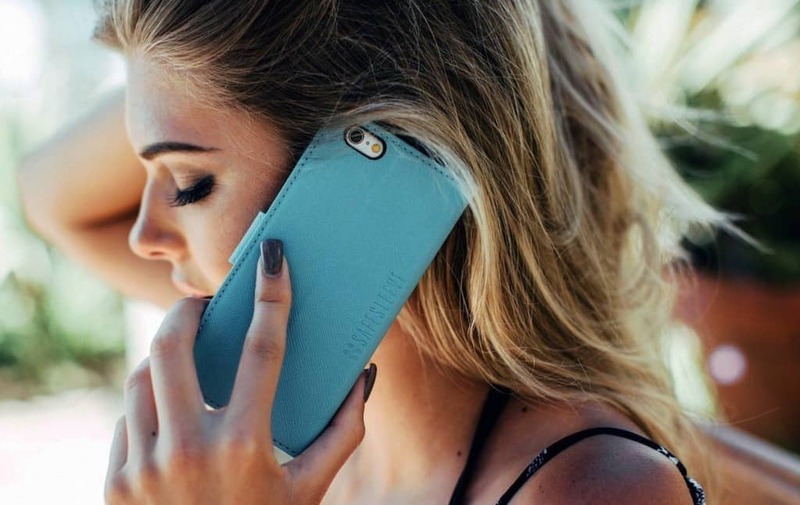 With any sort of flap case, like this one, you absolutely need to actually close the protective flap when you are talking on the phone, or it will do nothing to reduce your exposure. So, to use this case correctly, just be sure to close the protective front cover whenever you are going to be putting the phone up to your head, after you make or receive a phone call. We’ll talk about a bunch of other ways to reduce your exposure to cell phone radiation later, but I just wanted to make that point really clear right away. Take a quick look at this video to get an idea of how the Defendershield cell phone case works. Overall, this is, in my opinion, just the best EMF protection case on the market, and the one I will continue to use for now. I also have to just give respect to the company. Like I talked about above in the “what to look for” section, the company you purchase products like this from really matters. I’ve talked with the owners of Defendershield, read the book they published, and am also a reader of their blog. You can tell that this is a company that truly cares about the dangers of EMF radiation, and making quality products to protect people. Their customer service is excellent, and they are constantly coming out with new products. If you want to try out one of their cases, you can see their entire line right here. Alright, now let’s talk about another case that I really like, and works largely similar to the Defendershield. In fact, I used to use this exact case before I tried out and fell in love with the quality of the Defendershield. All of their cases feature a front flap, that you close when you make or receive a phone call to block radiation. As you can see from the image, the front flap of the cell phone case contains both an EMF radiation blocking sheet, as well as a high impact resistant insert to protect the phone from falls. Thee material that they use to block the radiation inside of their cell-phone case, laptop case, tablet case, etc, has been shown to block as much as 99% of RF radiation, and 92% of ELF radiation from your devices. However, I do just want to point out once again, that this is a case where those findings are based off of the material technology in a controlled, FCC accredited lab, instead of the phone case itself. This is largely because it is difficult to test consistently the device in real world settings. I will say that I personally found the case to reduce EMF radiation when used correctly. Again, emphasis on using it correctly by closing the front flap whenever you make or receive a phone call. As far as the case itself, this is absolutely fantastic product. It comes in a ton of different colors to match any style, and they have cases for just about every phone on the market. I love that the case acts a stand, as well as a wallet. Just like my Defendershield case that I’m using now, you can use this as your everyday carry for your money and basic cards. It has RFID blocking, so you don’t have to worry about your cards being hacked. Just remember to have the front flap closed when your on a call, have the front flap against your body when it’s in your pocket, and keep the phone at least 8-12 inches away from your body when the flap is open to reduce your exposure. Check out this page to see a full list of all the phones SafeSleeve carries. This next case is probably one that you haven’t heard of, at least if you live in the United States. This is not a case that I personally own, but I have friends that absolutely love their case, and have found it to do a good job of blocking EMF radiation. One thing that I like about their product description, is that they admit right away that although the anti-radiation membrane that their phone cases utilize can block up to 99.9% of RF radiation, the case itself only reduces it by 91% since it is only the front flap that is blocking anything. Although 91% is still extremely good, and I would expect it to be a little bit lower, I like that they are open about this. 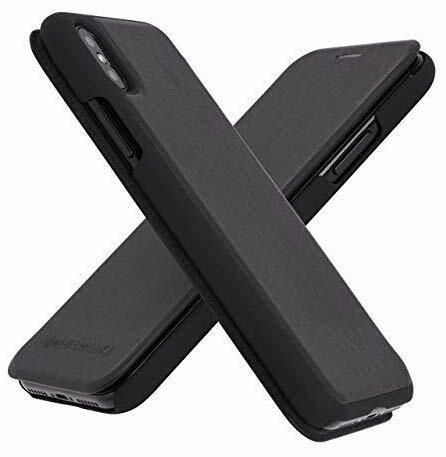 This case works like the previous two, in that it only has EMF protection in the front flap that needs to be closed when you are on a phone call. It has a magnetic clip to help keep the case closed. It looks and feels like real leather, but it’s actually some sort of vegan leather. Inside is a snap-in inner rubber case that holds your phone in place, and also protects it from falls. Where I feel like this case is lacking a little bit, is the company itself. Their website, radiarmor.com, was a bit difficult to navigate in my opinion. For example, their listing for their cell-phone case mentions specifically that the EMF blocking capability was proven, but I couldn’t find that research anywhere on their website. If you find it, be sure to let me know. Although it doesn’t seem that the company has been around as long as Defendershield, SafeSleeve, or RF Safe, I still think that this is a pretty high quality EMF protection that is worth trying out, especially given its lower price. If you want to try it out for yourself, you can only get it on Amazon. Alright, let’s talk a little bit about RF Safe and their case. This is a case that I purchased myself, and have tested, and do believe that it works well at blocking EMF radiation from your cell phone. RF safe has one of the largest selections of cases on the market, with specifically designed cases for just about every popular phone model. 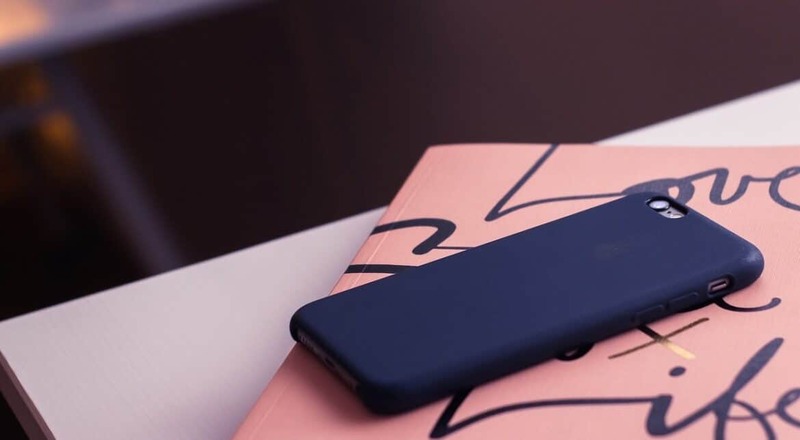 The case itself works just like most of the cases in this article, with a front flap containing an EMF blocking material to protect you while on phone calls. The back of the phone obviously contains no blocking material, and for good reason. When cell-phones have poor reception, they work harder to maintain connection and output far more EMF radiation. If you had blocking material on the sides or back of the phone, you would force the device to amp up it’s cellular signal, reducing battery life and increasing radiation. Although I’ve never worked with the team over at RF safe, one thing I will give them credit for is the amount of research that they have done. 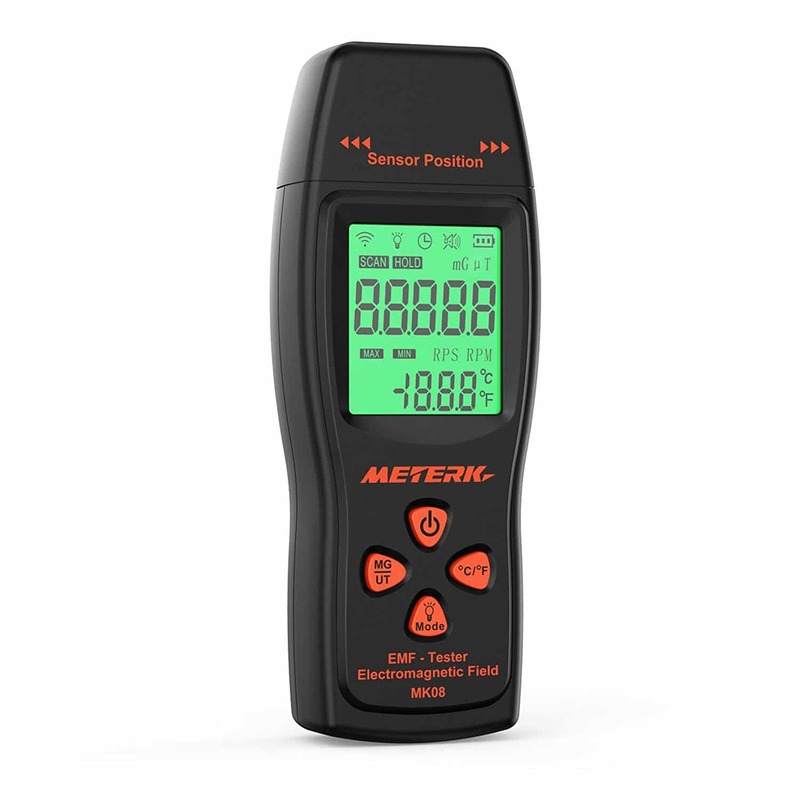 Although they have wide selection of EMF protection products, they seem to be a very research focused company, putting, for the most part, quality information out. They have ruffled a few feathers by specifically calling out competitors, but this isn’t necessarily bad in the long run, especially for us the consumers. Separate from the EMF protection capabilities of the case, I don’t personally like the look or functionality as much as the Defendershield or the Safesleeve, but that is more personal preference than anything. If you’re interested in trying out one of their cases, or checking out their website, you can do that here. Alright, now we get to an EMF protection smart phone case that is actually designed quite a bit differently than everything else we’ve looked at so far. Whereas the previous cases used a front flap made of a blocking material to protect the user, Brinkcase (the company behind this case) has an entirely different technology. I don’t want to go too in depth on this since I already covered it in my review of this product, but I do think it’s important to outline how this case is meant to protect you from EMF radiation. Remember that the way that cell-phones work, is that they transmit data in the form of packets to cell towers in the form of Radio Frequency, a type of EMF radiation. If you block this signal entirely, not only do you make the phone work harder and emit more EMF radiation, but it won’t be able to function. According to Brinkcase, if you utilize a conductive material such as a copper plate, it takes the omni-direction EMF and forces most of it to emit out of the back of the phone. This, in theory, should work similar to other cases in that it protects the brain from harm when using the phone. So, if you notice in the pictures the mesh on the back of the phone, you’ll actually see some of the copper antenna contained in the case. This has been specifically designed to pick up the cell signal and send it away from the body. 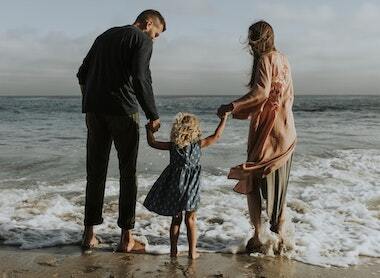 The company claims that this should reduce your exposure by as much as 67%, which they say is “As Low As Reasonably Achievable,” which is where they get the name A.L.A.R.A. Alright, now let’s talk about the case itself. I bought this case a while back so that I could try it for myself, and I used it on the iPhone 7 I had at the time for about a month. I got this one from Amazon and I actually really did like some things about the case itself. First of all, although I’ve gotten used to my Defendershield wallet case, and really love it now, it’s not what everyone is used to. Since this case doesn’t have a front flap, it’s a little less obvious that it’s an EMF protection product and looks more like just a stylish phone case. It has a grippy, tactile outer case that feels really nice in the hand. It feels like it does a good job protecting the phone itself, and on their site, it says “Drop test protection exceeds military specifications.” To be honest, I didn’t know the military had drop test specifications for cell phones, but overall I do think it does a good job protecting the phone. Overall I’m not personally as confident that this does as good of a job protecting the use from cell phone radiation as some of the flip cover products, I do think the case itself is a nice product that a lot of people will probably really like. This probably isn’t a brand that you have heard of, and honestly, I hadn’t heard of it either until a colleague mentioned that he had picked one up. 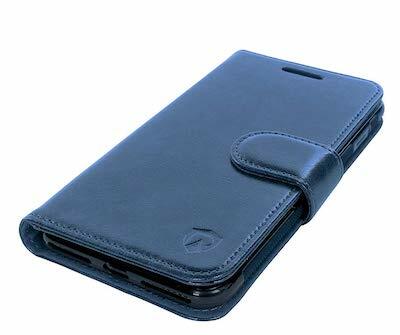 It is a little bit on the more expensive side, but that is because the case uses genuine Italian leather. So, if you’re looking for a stylish case that doesn’t skimp at all on design, but still offers good EMF radiation protection, this case might actually be a great fit for you. I haven’t personally tried this product, but from talking with my friend, and reading online, it seems like it’s actually probably really nice. The leather has a really soft touch to it, the design is stylish, the magnetic strap seems like it’s easy to use. They claim in the Amazon listing that the product blocks up to 96% of EMF radiation, and that it was proven in an FCC certified lab. They don’t post the results on the listing itself, and I haven’t found contact information yet to get a copy of that, but as soon as I do I’ll link to it. 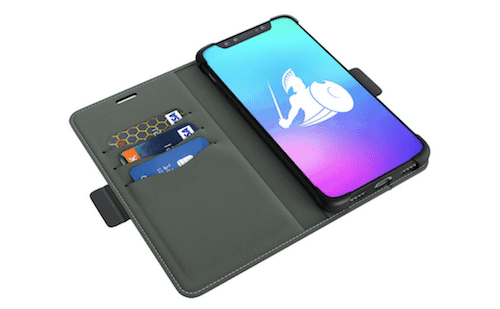 The case has a built-in wallet, and a few other fun features like an extra sim card pocket as well as a little pocket for the sim card remover needle. 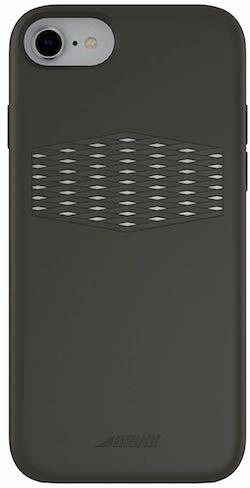 Overall, I actually think this looks like it’s probably a really nice EMF protection case, if you want to give it a try, you can pick it up on Amazon. Check out the current price from WaveWall. Alright, let’s talk a little bit about another case that is more popular overseas than it is in the U.S. WaveWall has a selection of EMF protection products, with their flagship product being their flip open EMF protection case. Instead of a horizontal flip front-flap like the Defendershield or the SafeSleeve, the WaveWall case is a vertical flip, so it opens more like an old flip-phone, folding down. This isn’t my personal preference, as I found it to be a little less intuitive. However, it is still a wallet case, so it does hold some of your money and cards. As far as EMF protection goes, it works like most other anti-radiation cases, where the front flap needs to be closed while you’re on a call in order to get any protection. You can take a look at this short video from WaveWall to get a better understanding of how their case works. I tried this case out on my own phone for about a week and was surprised to find that I got used to the way it flipped open and found the case to be of actually pretty high quality. It didn’t convince me to give up my Defendershield, but I do think it could be the right protective case for some people. OK, now that we have spent so much time outlining which EMF protection products are best in my opinion, let’s take a few minutes and talk about why you should even care. After that, I’ll summarize some other great ways that you can reduce your exposure to EMF radiation. Ok, so, why do we even need an EMF protection cell phone case or other products? Well, if you’ve landed on my site or on this article then you probably at least have some understanding that exposure to EMF radiation, especially in close proximity and over long periods of time, does cause biological harm. You see, when your cell phone transmits any data, whether that is over a phone call, a text, browsing the internet, or even connecting to Bluetooth, it does so through Radio Frequency, a form of Electromagnetic Radiation. This data is sent in packets over radio frequencies and received by something like a cell tower or other device. If you have an EMF meter, like the Trifield TF2, you’ll notice that when measuring RF radiation, it is hard to get a consistent reading. The reason for this is that RF radiation from a cell-phone is sent in packets, and does not emit consistently like would be the case with magnetic or electric field radiation. These packets are much larger when operating the phone, and therefore the radiation your body is exposed to is obviously much higher. This radiation emitted constantly by your phone has absolutely been proven to have biological effects on the body. Now, you may be wondering why the radiation emitted from your phone isn’t more regulated, and in fact, it is (sort of). In the United States, and many other countries, they used a measurement called Specific Absorption Rate, or SAR, to determine how much radiation the body absorbs from various devices. Every phone manufacturer must measure and report this number, and it can’t be over 1.6 w/KG of body weight. However, if you’ve read any of my articles on SAR you may understand that this isn’t actually a great measurement of just how dangerous a cell phone is. I won’t go into all the reasons why in this article because it’s a bit beyond the scope. The bottom line is, EMF radiation from devices like your cell phone have been shown in hundreds of studies to cause potential harm. If you use your cell phone for as little as 30 minutes a day, after 10 years you will have a 40% increased risk of developing a brain tumor. That you are considered “high risk” if you’ve used your phone 1640 hours in your lifetime. This “high-risk group” is 2 times more likely to develop a brain tumor in the temporal lobe. When holding your cell-phone close to your head, the temporal lobe is the area of the brain closest to the antenna. When brain tumors were found in the test group, they were twice as likely to be found on the side of the head where the cell phone was used. This is only a small sample of the hundreds of papers, studies, and research that has been done on EMF radiation, so if you want to read way more here is a list of 139 papers as well as their conclusions. Update: The links no longer work, but if you just copy the paper and google it you should be able to find it! Ok, now that we’ve skimmed the surface of why the RF radiation emitted from your cell phone is potentially dangerous, let’s talk about some ways we can reduce our exposure. This is going to be more of a summary overview, as I already have an extremely comprehensive post on this topic. However, I think it’s important that you understand that buying an EMF protection case like the ones I talked about above, is only one small part of a comprehensive plan to reduce your exposure to radiation. So, let’s go over some of the most important things you can do. When it comes to anything involving EMF radiation exposure, the two most important things you can do are to use your devices less, and get distance whenever possible. It’s important to remember that when it comes to the harm from RF or EMF radiation, the damage is cumulative. So anything you can do to reduce your exposure in any area of your life will help to protect you. Next, distance is your best friend. There is something called the inverse square law of physics, that essentially states that as we gain distance from a source of radiation, we quarter our exposure to it. This essentially means that distance will give us exponential protection. So doing things like using speaker phone, texting instead of calling, or wearing a pair of Air Tube headphones can all help you get distance, and protect your brain. Whenever it comes to radiation exposure, the two most important things you can always do, is reduce your use, and get distance. Reducing your use is simple, we understand that the biological dangers of EMF radiation are cumulative, so any reduction goes a long way. Getting distance just means hold your phone a little farther away from your body, use speaker phone when possible, headphones when possible, etc. If you have a short phone-call to make, consider sending a text instead. Anything you can do to just reduce the amount of time that you are holding your smartphone will go along way in reducing your radiation exposure, and likely any pain in your hand or fingers. This isn’t a tip that enough people focus on, but it’s a really important one. When your phone has poor signal, it actually has to use far more power to try to maintain a connection and improve it’s signal, resulting in far higher radiation. Some studies even suggest it could emit as much as 1000 times the EMF radiation if it is at 1 bar or less. Just simply check your cell connection before making the call, and if the connection is poor (and you can afford to wait) try to hold out for a better signal. This is another tip that is super simple, but not enough people actually think about. When you go to make a phone call, many cell-phones have been known to emit a burst of radiation as they are attempting to connect to the nearest cell tower for the call. It takes much more power and connectivity to make the call than it does to maintain it. So, all you have to do to avoid this is wait about a second after you answer a call, or after you make (and the other person answers) a call. Did you know that your cell phone emits EMF radiation, even when it’s not in use? That is because your phone is constantly using WiFi and cellular data to update emails, receive text messages, update apps, and so much more, even when you aren’t using the device. So, if you are doing anything on your phone that doesn’t require cellular connection or WiFi, just flip the phone into Airplane mode. This cuts the RF radiation to essentially zero, and will dramatically reduce the radiation absorbed by your hand or your head. This is also a great idea before you go to bed, as having a phone right next to you while you sleep really isn’t a great idea. I talk about Air Tube headsets quite a bit in my posts, I even wrote up the most comprehensive guide to Air Tube headsets on the web. Well, this is for a really good reason. Headphones have always been a great way for us to make phone calls, or watch videos, or listen to music on our devices without having to have them really close to our head. The problem is that many headphones actually emit a fair bit of EMF radiation in extremely close proximity to your head. Air tube headphones on the other hand, have a speaker that is about halfway down the cord, that sends the sound up a tube of air to your ears. This moves the source of the radiation far enough away that your exposure is cut to almost nothing (see the image to the right to visualize this). If you’re experiencing pain in your hand or tingling in your fingers while using your cell-phone, try getting a pair of Air tube headphones to make your calls on. The best pair on the market in my opinion, and the ones I use, are these from Defendershield. If aren’t able to pick up a pair of Air Tube Headphones to use, try using speakerphone whenever possible. For example, when you’re on a drive and need to make a call, just put your phone on speakerphone instead of holding it up to your head, it’s safer in more ways than one! If you want a bunch more ways that you can reduce your cell phone radiation exposure, check out my full guide here. Now let’s answer a few other related questions. Do EMF Protection Stickers Work For Cell Phones? This is a tough one to give a straight answer too, because in reality, I don’t know. I wrote up a huge guide on Anti-radiation stickers here, but had a hard time coming to a definitive conclusion, and I’ll tell you why. If you’ve searched for “EMF Protection From Cell Phones” on Amazon or somewhere else, you’ve probably come across some sticker or diodes or something else that is supposed to reduce or absorb the radiation from your cell-phone. The problem is, that this is not measurable with something like an EMF meter. Since usually they say that their technology changes the wave form of the radiation, or alters it, or provides a protective field, or something similar. However, you’ll notice that none of these sticker products actually say they make a measurable reduction in the EMF’s, and that instead you’ll just have trust their own studies and research. So, although I do think it’s possible that these products could have some positive effect on the EMF radiation, there isn’t really a way for me to know. So, for now, I would highly suggest you stick to a product we know works, like one of the cases I mentioned above. Do Any Phone Cases Block 100% Of EMF Radiation? Well, none of the ones I mentioned in this article do, and that is for a few reasons. First of all, if you blocked all of the EMF radiation, you’d also not be able to use the device at all. Your phone has to be able to connect to something to have any kind of connectivity, and that connection requires the use or Radio Waves, which is a form of RF or EMF radiation. So, all the cases I mentioned in this article, only attenuate, or block, the radiation coming directly towards your brain, but leave the back side open to not inhibit your phones ability to maintain a call. Remember in the tips above that if your phone has to work harder to get a signal, it will also emit more radiation. There are faraday bags intended just for cell-phones that will block all of the radiation from your phone, but you won’t be able to use it while it’s in there. These work great if you want a safe place to keep your phone when you’re traveling or not using it. 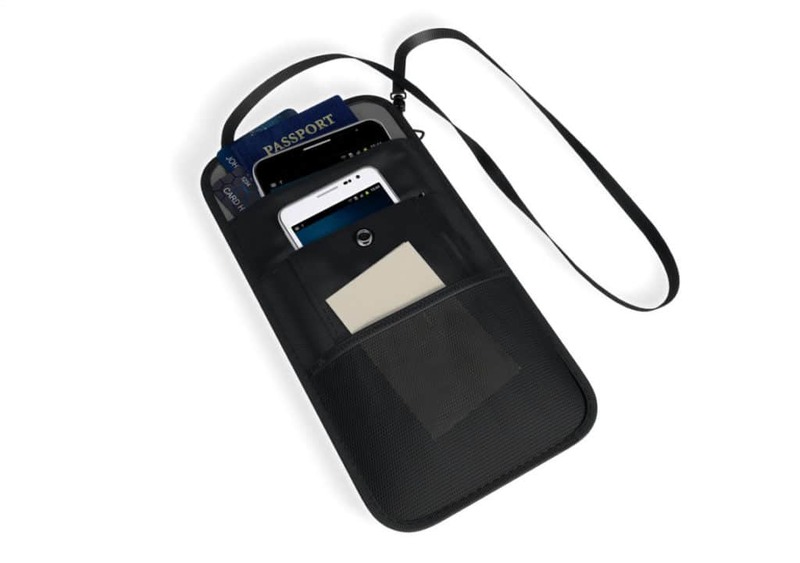 If you want to learn more about the best faraday or RF blocking bags for phones, check out this article. Alright, I think this article has probably gone on a bit longer than it needed to, and if you finished it, I truly commend you! I have such a passion for EMF protection, and I love to help people. If you have questions about anything in this article, please don’t hesitate to contact me! I created and currently manage EMF Academy, one of the premier sources for EMF safety knowledge. I am so passionate about spreading this crucial information. If you need anything, just shoot me an email at Chr[email protected] and I'll do everything I can to help.